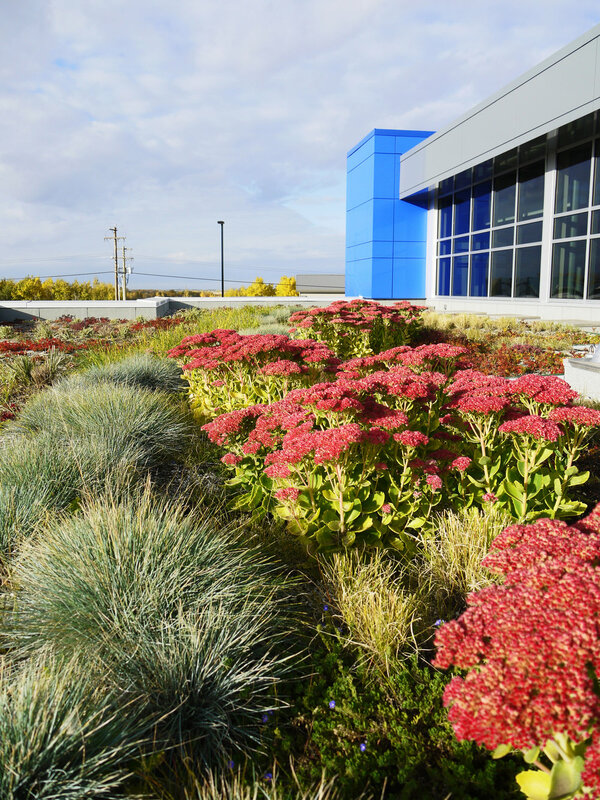 This green roof serves as a sustainable amenity for a major commercial and industrial building in Stettler, ab. As a strategy to set a precedent in low energy consumption, ATCO integrated a sustainability program at their Energy Efficient Operations Centre in Stettler, AB. This includes a high-performance HVAC system, triple-glazed windows, low-consumption water features, a rainwater storage system, and a 2,200 sq. ft. green roof. The primary purpose of this green roof is to provide thermal insulation above the conference rooms. However, our team designed the planting arrangement to be a visual demonstration of sustainability as well. Taking into consideration the environmental conditions of the site, our goal was to create shelter from the prevailing winds to reduce wind scour. The irregular topography, with rows of grasses and upright species are planted in deeper mounds to create friction to slow down the wind. This green roof also absorbs rainwater runoff that otherwise would end up being used in the wash bays.